This year's Stumptown Tart is being released tomorrow (Thursday, April 18, 2013) at the Bridgeport Brewpub, 5:30-8:30 PM. This year's brew highlights blueberries for the first time in the 6-year run of the series, but also has raspberries and blackberries. All told, there are 15 pounds of fruit per barrel; the fruit was the most expensive ingredient in the brew -- 150% of the cost of the malt. I got to taste this year's batch yesterday just as the first bottles were rolling off Bridgeport's line. It's a good one. Forget about the "Tart" in the name, this isn't a sour beer. As usual, there is a little bit of Belgian tripel character -- half of the batch is brewed with Bridgeport's house ale yeast, half with a Belgian strain -- and the blueberries come through nicely. This might be the best batch since the Cherry Stumptown Tart in 2009. The beer is pretty, and the blueberries give a nice cotton-candy pink tinge to the head. 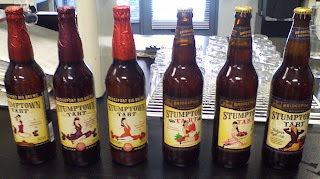 There is live yeast in the bottle, but it's not really a beer designed for aging -- drink it fresh. The pinup model for the label, Bernie Dexter, will be on hand at the release party tomorrow, and she will even be manning a kissing booth. This year's label has her dressed a little more modestly than years past, so I guess they had to kick it up a notch by allowing actual physical contact. 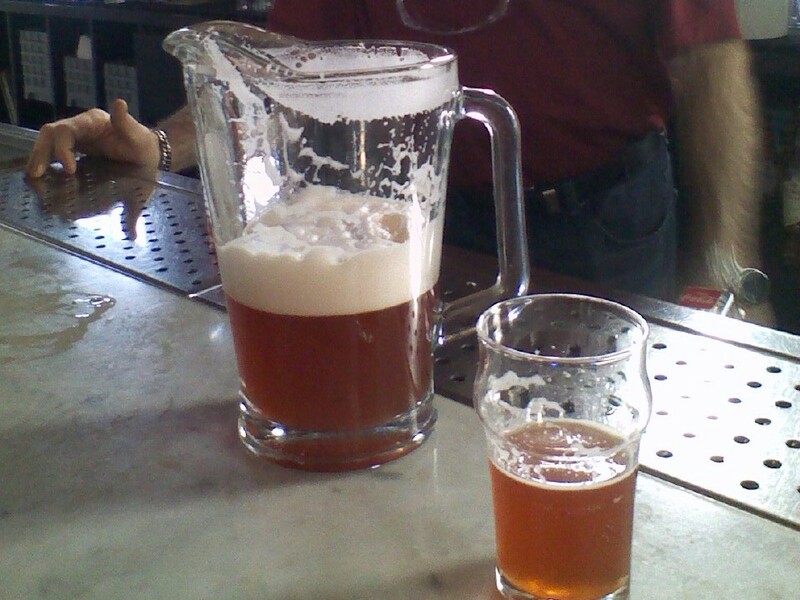 You'll also get another chance to try it this weekend at the Cheers to Belgian Beers festival: Friday, April 19th from 5:30 p.m. to 8:30 p.m. and Saturday, April 20th from noon to 8 p.m. at Metalcraft Fabrication (723 N. Tillamook). Without much fanfare, Deschutes has added a wonderful session ale to its roster of year-round six-packs: Deschutes River Ale. Its strength of 4% ABV means it is actually what some states call "3-2 beers" -- 3.2% alcohol by weight. I wonder if that means they can sell it in grocery stores in 3.2 states like Utah, Colorado, and Oklahoma, and if that was part of the brewery's strategy or just a happy accident. Although it's a 3-2 beer and the brewery describes it as "golden or blonde", it's a little darker than that, and you won't have any trouble distinguishing it from fizzy yellow swill. It's got a satisfying, slightly sweet malt body, with a nice dose of flowery hops but very little bitterness. Jeff Alworth has more flavor analysis over at Beervana. I first tried River Ale last fall when the Portland pub had an absolutely delicious fresh-hop version of it on tap. Luckily, the regular version out now is nearly as good, and given its pedigree as an English-style bitter, it's really nice if you happen to catch it on the cask engine at one of the Deschutes pubs. Meanwhile, six-packs are starting to appear on shelves around town. Give it a try when you need a beer that you can have a few of without making a fool of yourself. Well, not a complete fool. The last few years have seen explosive growth for beloved California brewer Lagunitas. This Beerpulse article says production increased by 50% from 2011 to 2012, after a 56% jump in sales the previous year; Lagunitas owner Tony Magee noted on Twitter that January's sales were up 72% from the previous year. All that growth is before the company's new production facility in Chicago has even been finished. Now the eccentric beer company is branching out in a completely unexpected direction by acquiring Dr. Bronner's Magic Soaps, the iconoclastic family-run company that produces the Dr. Bronner's line of soaps that have long been a favorite of campers and hippies everywhere. 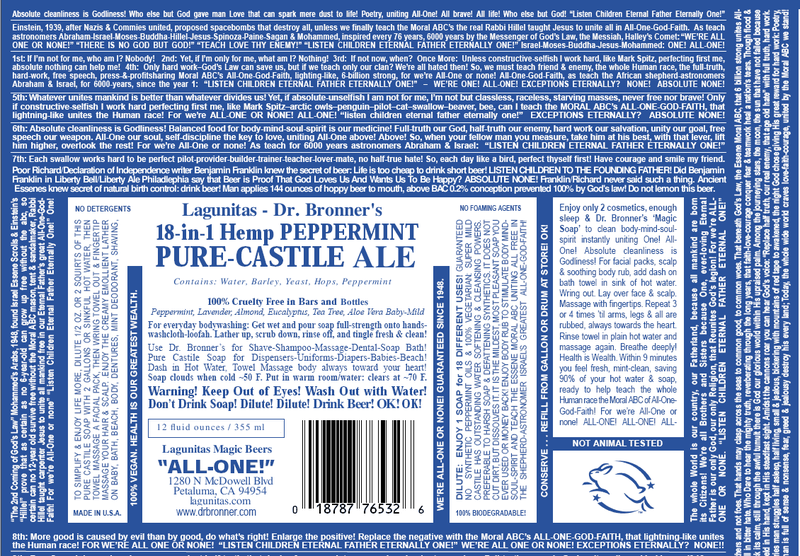 As a kind of intramural collaboration/consummation, Lagunitas is paying homage to Dr. Bronner's famous peppermint liquid soap by brewing a special amber ale called 18-in-1 Hemp Peppermint Pure-Castile Ale -- yes, dry-hopped with fresh peppermint. 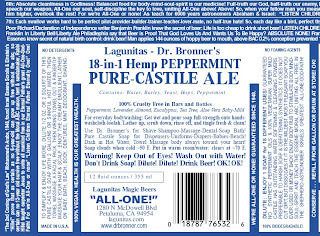 That's the same name as the soap, except for "ale" of course, and the label lovingly imitates Dr. Bronner's jumbled spiritual exhortations -- which are not all that different from some of the rambling musings on Lagunitas bottles and six-pack holders, come to think of it. Click on the image to enlarge it and see if you can find the beer-specific verses that have been added to the ale label. Apart from similar styles of prose, products known as "suds", nonconformist founders, and a shared interest in hemp products, what could possibly have brought these two companies together? Apparently some of the current generation of Bronner soapmakers wanted to add a hop-infused soap to their product line, and being fans of Lagunitas beers, reached out to the brewers in Petaluma for advice on hop-oil extraction and handling. A kind of mutual admiration developed, and since absolute cleanliness is 99% of brewing success, Lagunitas popped the question of corporate matrimony. Dr. Bronner's will keep its name as a wholly-owned subsidiary, and the current management of the soap company will stay on board. The deep pockets of Lagunitas will help the soapmakers enter into new markets and finance new product development, such as the hop soap mentioned above. Given the rapid growth of Lagunitas, you could also imagine that Dr. Bronner's location in Southern California was attractive to the brewer. Once they wrap up the Midwest with their new Chicago brewery, perhaps they'll use their soap factory as a stepping stone towards building a San Diego brewing facility. I haven't particularly cared for the few mint beers I've tried to date, though I do have a soft spot for peppermint. As a longtime fan of both Dr. Bronner's and Lagunitas, I am really looking forward to trying the 18-in-1. Let me know if you try it, and don't forget -- in the immortal words of Dr. Bronner -- KEEP OUT OF EYE! OK!